The automotive cameras market in terms of value generated $831.7 million in the year 2017 and is expected to grow at a rapid pace over the forecast period of 2018-2026. The increasing road accidents, traffic congestion, change in consumer preferences and stringent governmental regulations have resulted in an increased demand of automotive cameras for the vehicles. The differential performance capabilities of the automotive cameras motivated the legislative bodies to issue regulations mandating several driver assistance features in vehicles such as adaptive cruise control, parking assistance, lane departure warning, and automated emergency braking, among others. The automotive cameras market in terms of value generated $831.7 million in the year 2017 and is expected to grow at a rapid pace over the forecast period of 2018-2026. The global automotive camera market report, is a compilation of various segmentations including market breakdown by type, technology level, vehicle type, and different geographical regions. This report provides a detailed market analysis and forecast with respect to various types in the automotive camera market such as front-view cameras, side-view cameras and rear-view cameras. Moreover, based on technology level, the automotive camera market is segmented into level 1 (Advanced Driving Assist Systems), level 2 (Partial Automation), level 3 (Conditional Automation), level 4 (High Automation), and level 5 (Full Automation). While highlighting the key driving and restraining forces for this market, the report also provides a detailed study of the different vehicle type, which include passenger cars and commercial vehicles (light commercial vehicles, heavy trucks, and heavy buses). • What is the size of the global automotive camera market in terms of value from 2017-2026? • Which type is dominating the global automotive camera market in terms of value? • What is the revenue generated by the different automation level in the global automotive camera market from 2017-2026? • Which vehicle type in the automotive camera market is expected to grow the fastest from 2017-2026? • What are the major factors challenging the growth of global automotive camera market? • Which type of new strategies are being adopted by existing market players to make a mark in the industry? • Which region will lead the global automotive camera market by the end of the forecast period? • What is the market share of leading component manufacturers in the year 2017? The report examines the role of the leading market players involved in the industry as well. The Company Profiles section includes highlights of significant information about the key companies involved along with their financial positions, key strategies, developmental activities of the recent years (2015-2017), and SWOT analysis of these players. Some of the key players in the automotive camera market are AEi Inc. (the U.S), Autoliv Inc.(Sweden), Continental AG (Germany), Aptiv Plc (the U.K), Denso Corporation (Japan), Gentex Corporation (the U.S), Hella GmbH & Co KGaA (Germany), Hyundai Mobis Co Ltd. (South Korea), Mobileye NV (Israel), OmniVision Technologies Inc.(the U.S), Magna International Inc. (Canada), Robert Bosch GmbH (Germany), Valeo SA (France) and ZF Friedrichshafen AG (Germany). 7.8 HELLA KGaA Hueck & Co. The technological advancement in the automobile industry is primarily attributed to the changing consumer preferences, growing focus towards driver safety, environmental concerns, and stringent government regulations which are focusing towards crash avoidance rather than crash survival. The stringent regulations are framed to advance the vehicle safety on public roads and supporting an early integration of Advanced Driver Assist Systems (ADAS) in automobiles. In the past few years, visible surge is witnessed in the number of vehicles equipped with the ADAS features, such as, adaptive cruise control, parking assistance, lane departure warning, traffic jam assist, automated emergency braking, and blind spot detection, among others. These functions are executed in the vehicle with the help of several ADAS components such as cameras, radars, lidars, ultrasonic sensors, and electronic control unit (ECUs), among others. Automotive camera is a vital part of the ADAS equipped vehicles and with the growing penetration of ADAS and autonomous vehicles in the auto industry, the demand of automotive cameras has increased, and the similar trend is expected to continue in the future. The report defines and estimates the market size and future growth potential of automotive cameras market during the forecast period (2017 to 2026). The global automotive cameras market generated $831.7 million in 2017. The evolved growth of the automotive camera market is attributed to several factors, such as government rules mandating the integration of camera to reduce road accidents, change in consumer preferences and encouragement from the insurance companies. In addition to this, an increase in the number of product developments, collaborations, and merger and acquisitions, among others, are also witnessed in the past few years, thus fueling the growth of the automotive camera market. However, the global automotive camera market face certain challenges that are restraining the overall growth for the automotive cameras, such as, operational glitches related to cameras and high cost of the camera modules, among others. On the other hand, the automotive cameras market offers wide opportunities for vehicle insurance companies, and CMOS based camera manufacturers. The rear-view cameras held a significant share in the automotive camera market for the year 2017. The market dominance of rear view cameras is attributed to the factors such as low cost of these camera and lower power consumption. The low cost and high operational performance associated with rear view cameras have led to the present mass deployment of these cameras in automobiles. Moreover, government rules mandating the usage of rear view cameras in the U.S, Europe and other parts of the world, further pushes the integration of rear view cameras in automotive industry. The market for level 1 (ADAS) automotive cameras held the maximum share of the total automotive camera market in the year 2017. High market volume of ADAS integrated vehicles, and early application and greater market penetration of cameras in the vehicles account for the market dominance of cameras for level 1 automation. Higher automation necessitates the use of multiple cameras in autonomous driving system. In 2017, the market value of the passenger cars was higher than the commercial vehicles. 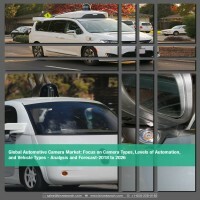 This was due to the higher production of ADAS and autonomous passenger cars, increased production of fully autonomous prototype cars, thus demanding higher sales of cameras. Europe dominated the global automotive camera market in the year 2017. This was majorly due to the present demand of highly automated vehicles in Europe and growing focus towards road safety. In addition, government regulations in Europe is also an important factor driving the demand for components of autonomous vehicles. In 2010, Euro NCAP, the safety certification body, launched a program called 'Euro NCAP Advanced' in order to increase the adoption of advanced safety techniques. Furthermore, Euro NCAP announced that cars integrated with ADAS systems will be awarded their top 5-star safety rating. Hence, these factors are leading to the increase in the demand of camera required for the automated vehicles in Europe. Some of the key players in the automotive camera market are AEi Inc. (the U.S), Autoliv Inc.(Sweden), Continental AG (Germany), Aptiv Plc (the U.K), Denso Corporation (Japan), Gentex Corporation (the U.S), Hella GmbH & Co KGaA (Germany), Hyundai Mobis Co Ltd. (South Korea), Mobileye NV (Israel), OmniVision Technologies Inc.(the U.S), Magna International Inc. (Canada), Robert Bosch GmbH (Germany), Valeo SA (France) and ZF Friedrichshafen AG (Germany).